One of the earliest cooks at the Orlando School was Ruby (Foster) Riffle. School lunch programs were in their infancy when twenty four year old Ruby Foster was hired by the Community Services Division of the Work Projects Administration (W.P.A.) to serve as the cook at Orlando for the school year 1938 – 1939. The national school lunch program began on a limited scale around 1932. It was a Depression era initiative created under the Reconstruction Finance Corporation which was established by President Herbert Hoover. During the Depression, farmers were having grave difficulty selling their agricultural products for a fair price. As a way of helping farmers get a market for their surplus goods and, at the same time, helping school children get a decent meal, President Hoover devised a plan for the federal government to buy agricultural products, known as commodities, and then to give the commodities to the states to distribute to school lunch programs. It was under a successor agency to this program that Ruby Foster was hired to prepare and serve meals at the Orlando School. Ruby (Foster) Riffle, then and now, is pictured here. 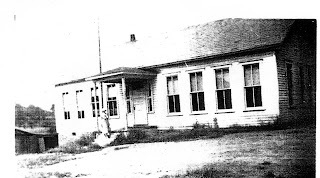 The Orlando Elementry School, after it was enlarged, is pictured below. 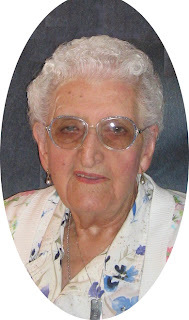 Ruby (Foster) Riffle is now ninety three years of age and lives in Weston. 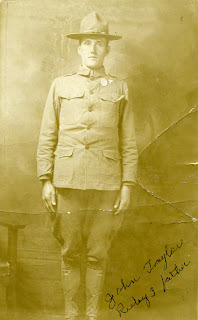 In 1938, Ruby, who was then unmarried, had just finished working for three years in the “sewing room” on the second floor of the old Burnsville Exchange Bank building in Burnsville under another W. P. A. project which involved disassembling World War I uniforms and fabricating new garments. The “sewing room” was winding down as a W. P. A. project and the workers were being re-assigned. Ruby, who had become an expert seamstress working in the “sewing room,” was about to become a school cook. Ruby lived “up the river” from Burnsville. 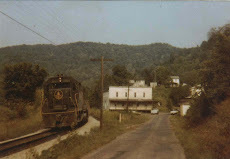 People in Burnsville colloquially referred to the many people who lived on the Little Kanawha River above Burnsville as people from “up the river.” In fact, Ruby lived about five miles above Burnsville , and above what Burnsville people referred to as the “second” or “upper” church. This church was actually the Olive United Brethren Church, and, since it was beyond the Methodist Church located at the mouth of Riffle’s Run , which was the “first” or “lower” church, the U. B. Church was thus known as the “second” church. Ruby lived about two and one-half miles from the “first” church at the mouth of Riffle’s Run. Transportation was always a problem for non-farm workers during the Depression. Few people had automobiles and there was no public transportation. There were also few jobs available during the Depression and many people who were lucky enough to have a job walked long distances to their places of employment. Ruby Foster was no exception. In order to travel to Orlando, Ruby walked down the dirt road (later State Route 5) two and one-half miles to the mouth of Riffle’s Run. Ruby would then walk to the head of Riffle’s Run, a distance of little over a mile. She would then climb the hill, crossing two barbed wire fences, and go down the other side of the hill to the head of Road Run. Ruby then walked down Road Run about a mile to the B & O Railroad tracks. She would then walk the railroad tracks to the Orlando School which was about a mile from the mouth of Road Run. After reading this travel itinerary, we can all agree that this was quite a walk, even in good weather. In the late 1930s, “global cooling” was the cry of the alarmists of the day. Indeed, winters were quite cold and snows were heavy in central West Virginia. Of course, schools were in session during the winter months as well as fair weather months. To allow herself time to walk to Orlando to prepare lunch, Ruby left home at six o’clock a.m. Ruby learned to make the distance from her home to Orlando shorter by walking faster. Also, the faster Ruby walked in cold weather, the warmer she would stay. Deep snows, however, were the main problem for Ruby, particularly in climbing the hill between Riffle’s Run and Road Run. Ruby found that if she wore men’s boots and coveralls with the legs tied at the ankle with cord, at least the snow would not climb her legs and make her colder. On some cold and snowy days, Ruby would walk all of the way to Orlando to find that the school was closed for the day because of inclement weather. Of course, Ruby could not warm up in the school house since it was closed. In order to sustain herself for the cold trip home, Ruby would go to Bill Conrad’s Store in Orlando and warm up in front of the pot bellied stove before starting out for home. When being interviewed for this story, Ruby modestly said that she wouldn’t know that she would describe herself as a “cook,” particularly since most of the school meals consisted of soup which came in large cans delivered from Sutton, which she opened, poured in a big pot, added water and heated. Ruby remembered that Raymond Skinner, a student and son of W. C. “Bill” and Lena (Groff) Skinner of Clover Fork, would help her lift the large pot of soup from the top of the stove to the serving table. Mildred (Morrison) McNemar advised the writer that she could remember the large soup ladle which was used to dish out the soup and the white porcelain bowls which were used. Mildred also remembered the smell of the soup as it was heating and that it smelled “really good,” especially if she had eaten little or no breakfast that morning. Virginia (Skinner) Bennett, daughter of Frank and Nina (Shipman) Skinner, recalled that before the lunch room was later added to the Orlando School building when she was in the sixth or seventh grade, tables were located in the main hallway for students to use to eat their lunch. Mildred Morrison McNemar also recalls that soup was not the only entrée on the lunch menu. She recalls that tasty peanut butter sandwiches and milk always went well with the hot soup. Although the school lunches served by Ruby Foster to the school children of the Orlando School sound meager by present standards, the children of the Depression found them nourishing and welcome. Ruby Foster welcomed the employment she found at the Orlando School. For her labors, she was paid the munificent sum of seventeen dollars and thirty five cents per month. 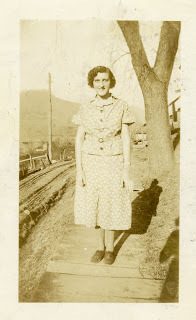 Even though Ruby walked a “fer piece” to get to her Depression era job as a cook at Orlando for a paltry wage, she was thankful in that day and age that she had a job when many other people did not. Ruby’s stay at the Orlando School was short. At the end of her first year as cook at the Orlando school, Ruby married Ralph Riffle who was employed as a “greaser” for the Pennsylvania Railroad in the Pittsburgh area. The newlyweds made their home in Pennsylvania for the next several years until they retired to Weston. Ruby fondly remembers her rigorous walks to Orlando those many years ago and the smiles on the faces of the young children as the hot soup filled the white bowls. Ruby (Foster) Riffle is the daughter of Mae Foster, a native of Clover Fork, and John T. Taylor, a native of Knawl’s Creek. During her youth, Mae Foster’s family moved from Clover Fork to a small farm on the waters of the Little Kanawha River. Living on a small farm which was not self-supporting, Mae Foster and her family took in washing from other families and did farm labor to help make ends meet. Ruby's dad and mom are pictured to the left and right. Forrest McNemar, husband of Mildred Morrison McNemar, and six years her senior, recalls the initation of the school lunch program at Copen. Forrest recalls that to he would bring fresh cow’s milk to school to pay for his lunch. The milk would be served to the children having lunch. Other children paid for their meals in kind the same way.